The theme is football, but the emotions passed around on stage at TheaterWorks are far more hard-hitting than any action you might see on a playing field. Playing the Assassin, David Robson’s gripping drama about responsibility, manhood, forgiveness – and football – is getting an electrifying run here with standout performances from Garrett Lee Hendricks and Ezra Knight reprising roles they originated last fall at Penguin Rep Theater in Stony Point, NY, where Joe Brancato, Penguin’s artistic director, also directed. The play is inspired by a real NFL incident in 1978 when Oakland Raider Jack Tatum hit New England Patriot wide receiver Daryl Stingley so hard the force of the tackle left him in a wheelchair for life. No foul was called but the rules of the game – what constitutes a fair hit -- changed and so did the lives of both men. 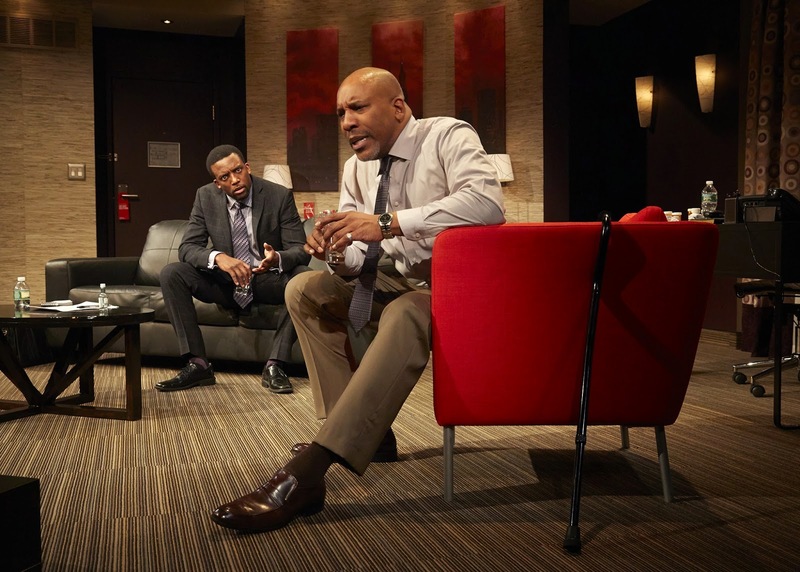 Robson sets the play in a Chicago hotel suite (designed by Brian Prather in a way that doesn’t make the hotel setting obvious at first) where former safety Frank Baker (Knight), a.k.a. “The Assassin” for his brutal tackles, considers the chance of a lifetime. A TV producer (Hendricks) offers him a contract (and money needed by the now-walks-with-a-cane Hall-of-Fame-reject) to do an interview during the upcoming Super Bowl. The catch is that he will be appearing with a football player named Lyle whom he left crippled following a hit in an exhibition game – and will be required to apologize. Baker is incredulous that Lyle would even be willing to do the interview, but Turner assures him it’s possible, as long as Baker is willing to apologize. That raises some issues for the veteran, who played for 12 years under rules which encouraged hard hits – for a League that looked the other way when bounties were paid to players for hurting the opposition. He did his job, Baker replies – and it left him without any coaching options, a shot at the Hall of Fame or any hope of being thought of in any way except as the man who had paralyzed Lyle. When Turner’s real motivations for wanting to air the interview are revealed “defense” and “offense” take on new meaning. A wide field of emotions runs wild with Turner demanding that Baker recreate the fated hit on Lyle. This scene, with fight choreography by Ron Piretti, stretches the reality of Robson’s drama a bit and seems forced. The emotions battling throughout the 80-minute drama are intense, however, as the men explore the consequences of choices, taking responsibility, dealing with hatred and finding forgiveness. Hendricks and Knight take hold of a wide range of emotions and score a touchdown in a play that questions not only motivations of pro sports, but what it really takes to be a man. Playing the Assassin runs (ha, ha) through April 26 at Theaterworks, 233 Pearl St., Hartford. Performances are Tuesdays, Wednesdays and Thursdays: 7:30 pm; Fridays and Saturdays: 8 pm; Weekend Matinees at 2:30 pm. Tickets $15-$65; 860-527-7838; www.theaterworkshartford.org.